Gearbox Oil 20/50 engine oil don't gear oil or synthetics. The best gearbox is the series V as it is all synchromesh and has close ratios. All synchromesh gearboxes have reverse on the right. Later Hunter type gearboxes can be fitted with a lot of trouble because of different spines etc., so are best avoided unless you need the stronger overdrive unit. 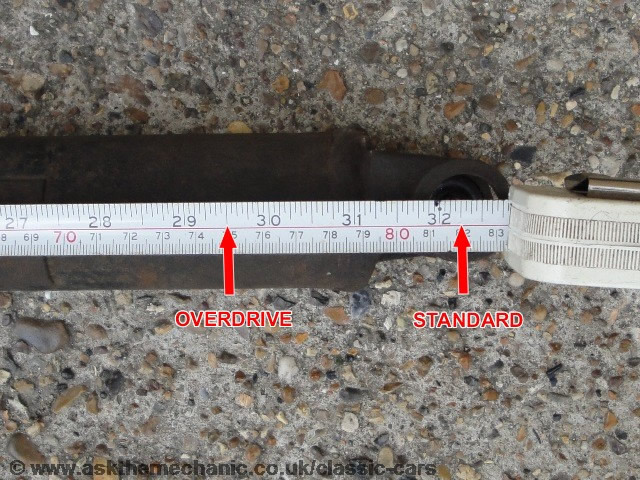 You will need an overdrive propshaft or have yours shortened as the gearbox is longer, the overdrive propshaft is 29.5"or 74.9cm between UJ centers see picture. 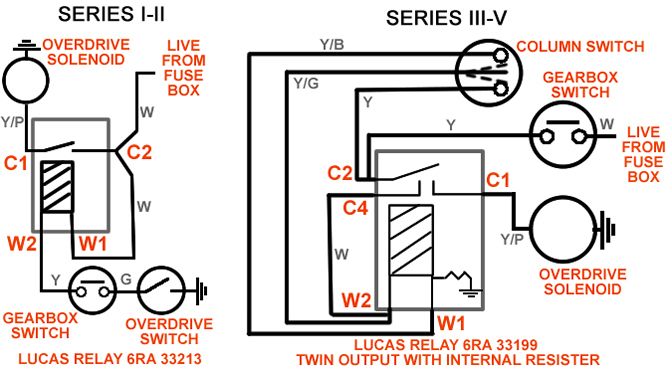 Overall length Standard - 39.34" O/D - 36.59"
This will be either a normal switch and relay (6RA 33213) if series I-II or self-cancelling relay (6RA 33199) if series III-V see below for wiring, I have simplified the Rootes wiring diagrams. The drive gears for the Speedo are different in the overdrive unit, plus Rootes often fitted a lower ratio back axle of 4.22:1 with an overdrive gearbox, instead of the standard ratio of 3.89:1. Rootes fitted different Speedo’s to overdrive cars to correct this, but unless you change to an overdrive back axle ratio (4.22:1) the Speedo will still read wrong, I would not recommend fitting the 4.22:1 overdrive ratio, as it is a bit low for modern roads but does give slightly better acceleration. I fitted an overdrive Speedo(will read 5% slow) then recalibrated by removing the Speedo needle and refitting it at 30mph (using SatNav for speed) it won't be correct at all speeds but will be at most speed trap speeds.